Nutritional requirements vary from horse to horse. However, there are 5 essentials for any healthy horse diet that we thought we would outline in this article. That way, you know that no matter what your horse’s daily routine is, activity level, job, or lifestyle, he requires these 5 basics as a minimum. The most important aspect of a beneficial health plan for your horse is that it successfully meets your horse’s most basic dietary needs. After all, you don’t want to provide your horse a meal from the salad-bar when he could have a five-star, quality main course every single day. 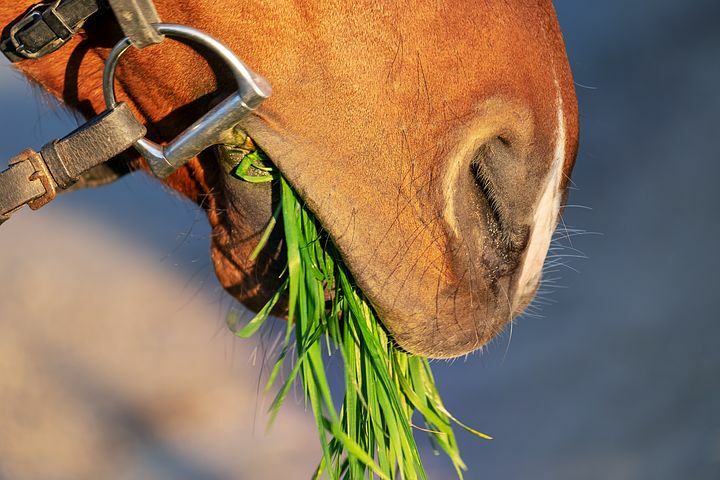 So, to help you out, here are our 5 essentials for a healthy horse diet. The importance of providing plenty of water for your horse to ensure effective hydration cannot be exaggerated. Water is by far the most important nutrient your horse requires for a healthy and well-balanced diet. Your horse should have easy access to clean water throughout the day. His supply should be replenished every few hours and checked regularly to ensure it is clean and fresh. Generally, horses drink around 45 litres of water every single day, so it’s more important than anything else that you ensure your horse is always supplied with clean water. Protein with a capital P is essential for any horse’s diet as it provides the basic building blocks for muscles, tissues, hormones, and enzymes in your horse’s body. An average horse’s diet should equate to between 10 and 12 percent of protein. Always ensure the protein is high-quality and check your horse is getting just what he needs. And remember, protein requirements do vary from horse to horse. Horses need a lot of energy and carbohydrates provide the basis for most of this. Just like humans, horses require good fats and complex carbohydrates in their diet to help generate energy. Fats and carbohydrates provide many benefits to horses, including anti-inflammatory properties, healthy physical development, and plenty of energy. Thanks to commercial feeds, adding good amounts of fats and carbohydrates into your horse’s diet is extremely easy, as many feeds are now supplemented with fats in the form of a stabilised oil. However, if you feed your horse stabilised oil alongside his normal feed, it is important to ensure you are meeting all your horse’s dietary requirements. This helps to keep your horse healthy and ensures he has a well-balanced diet. Your horse needs minerals in his body as they are beneficial in so many ways, helping to meet a variety of functional needs. While most horse feeds do have minerals added into them, they are often low in salt, so we recommend providing a good salt source for your horse – such as a salt block – to replenish your horse’s supply. Horses are unique from other animals and humans in that their bodies can naturally produce vitamin C, so they don’t need it to be added to their diet. However, horses do require an intake of other vitamins on a regular basis, such as vitamins A, E, and D. Most of these vitamins can be found in pasture with hay or taken in while spending time outside in the sun. If you’re unsure how many vitamins your horse is taking in on a regular basis, it is worth checking their feed and ensuring all their vitamin requirements are being met. After all, vitamin deficiencies are a serious problem and can lead to significant health issues if not addressed. Horses love to graze and are made to spend most of their time outside grazing in the fields and meadows. Because horses are natural grazers, they consume various fibrous feeds and enjoy a well-balanced and healthy diet. However, as this article points out, there are other essential elements of a horse’s diet that must be met, and these may require supplements or special varieties of feed to be met. If you’re unsure what your horse is lacking, or which minerals, vitamins, fats, or carbohydrates they need more of, consult a specialised veterinarian. They will be able to suggest an appropriate diet plan for your horse to ensure he gets everything he needs for a healthy and happy life. If you would like to find out more about feeding horses and what they can or cannot eat, check out our article What Do Horses Eat? A Few Facts on Horse Feeding for more information!